After a wave of criticism, including from the head of the Munich Jewish community, the “documenta 14” cultural center in the German city of Kassel canceled on Tuesday a performance exhibition likening the plight of refugees making their way to Europe by sea to Auschwitz. Charlotte Knobloch, head of Munich’s Jewish community, said on Friday about the exhibit: “What is planned here is a grotesque production.” While it is important to highlight the fate of refugees and the partial failure of the EU and international community to address the current crisis, it is “unacceptable and intolerable” to use the interests of refugees to “relativize the Holocaust,” she said. The installation was slated to run in Kassel – with a population of nearly 198,000 in the state of Hesse – beginning on Thursday for three days. The documenta 14 center claims it is the world’s largest exhibitor of modern art, with 160 artists from across the globe currently represented there. Berardi, who was born in Bologna in 1949, is an Italian Marxist. His poem, a soundtrack and pictures make up the “Auschwitz on the Beach” installation. Martin Sehmisch, the head of an organization fighting Antisemitism (Informationsstelle Antisemitismus Kassel) in the city, called the announcement of the installation a “statement of political and moral bankruptcy from those in charge” at documenta 14. 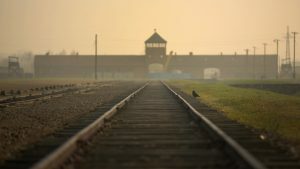 The Poland home of a Nazi concentration camp commander who tortured and murdered Jewish captives in the building, is reportedly being renovated and restored as a luxury family home, to the dismay of Holocaust education activists. Last year real estate developer Artur Niemyski bought the building, located in Plaszow, a suburb of Krakow, and plans to move in with his family when the repair work is complete, the Daily Mail reported Wednesday. Survivors of the camp told of his brutality, which included shooting Jewish prisoners for sport and torturing others inside the villa. On one occasion he shot dead a Jewish boy for leaving a room without permission and kept two guard dogs that he would occasionally order to tear victims apart. Oskar Schindler, who is credited with saving some 1,200 Jews from the Nazis during the Holocaust, was able to do so by taking advantage of his friendship with Goeth. Schindler was a frequent visitor to the home and many of those he saved by employing them in a munitions factory were prisoners in the camp. The villa was depicted in the 1993 Steven Spielberg movie “Schindler’s List,” in which actor Ralph Fiennes, playing Goeth, was famously shown shooting Jewish prisoners from the balcony of the two-story building. “My opinion is that this building was occupied for a small period by the Nazi, which should not influence this property forever,” Niemyski was quoted as saying. “Many houses in the area were occupied by Nazis. Officers from the camp lived in all the houses in the street. Bad things may have happened in the old properties, but basically these were living compounds. Generally, I want to restore the house to be once again a Polish family house and keep it like this,” he said. Niemyski added that while he will no longer allow educational tours to enter the home, he won’t be bothered if they gather outside. He had no intention to cause offense, he added, noting his good ties with Jews. Rabbi Naftali Schiff, founder of the British charity JRoots, said the renovation of the home was whitewashing its sinister past. “We welcome dialogue with the owner, but he has made it clear to us that he wants the world to forget what happened there,” he told the Daily Mail. 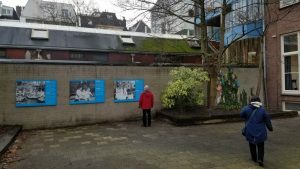 The charity, which organizes Jewish heritage pilgrimages, has in the past brought groups to view the dilapidated building. JRoots has launched a campaign to have the villa preserved as a memorial site. 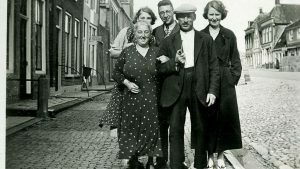 Much of the testimony on Goeth’s crimes inside the home came from his two Jewish maids, Helen Horowitz and Helen Jonas-Rosenzweig, who both survived the war after being saved by Schindler. On one occasion Goeth stabbed Horowitz in the leg for not setting enough places for dinner. Another time he assaulted her. The maids were kept in the basement of the building, which is now being renovated for use as either a workshop or a wine cellar. Former maid Jonas-Rosenzweig, who backs the memorial plan for the villa, spoke to the Mail of her experiences in Goeth’s captivity. ‘I was a prisoner in this house and a victim. I want the world to learn what happened there,” she said. Jonas-Rosenzweig served Goeth, who was married twice, and the mistress he lived with, beautician Ruth Irene Kalder. The Nazi often held extravagant parties for other SS officers. She was also tasked with taking care of the fearsome dogs. “One was black and white. He was so big,” she recalled. “I brushed the dog, I fed the dog. She recalled how one day Goeth told her he was going to start shooting from his balcony at slave laborers digging ditches along the road next to his garden. “He said to me, ‘Look at those pigs. If they don’t start working in a few seconds, they are all going to be dead,’” she said. The maid ran out to warn the workers and so prevented a shooting spree. 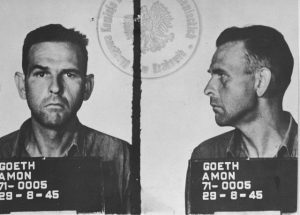 On September 13, 1944, Goeth was removed from his position at the camp and charged by the SS with the theft of Jewish property that, under Nazi law, belonged to the state, as well as with the mistreatment and abuse of prisoners under his command. But before he could be brought to trial, World War II ended and he was arrested by the US military in May 1945. He was put on trial and sentenced to death for “personally killing, maiming and torturing a substantial, albeit unidentified number of people.” He was hanged 10 days later, on September 13, 1946. 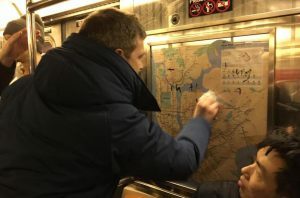 (JTA) — Commuters on a New York City subway used hand sanitizer to clean away swastikas and other anti-Semitic graffiti drawn in permanent marker on the train’s maps, advertisements and windows. The Manhattan subway riders discovered the graffiti on Saturday night. “Nazi symbolism. On a public train. In New York City. In 2017,” he wrote. At least one of the messages said “Jews belong in the oven,” according to the New York Daily News.